Well OK, we usually make them out of something sturdier than cardboard. People usually think of them as cardboard cutouts because that’s what you see them made of at the party store. We like to make them of display board, which is tougher stuff than cardboard, and prints better too. We do a lot of cutouts of people. Usually just one or a few, and not usually a celebrity, although we’ve done celebrity cutouts too. We did a whole set of politicians for the last NH primary! We need a good digital picture of the person you want to make a cutout of. 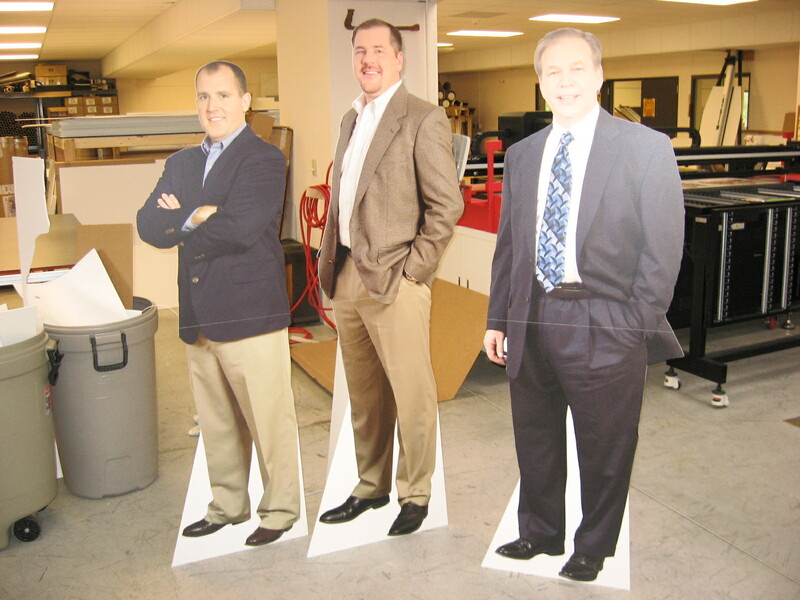 From there, we print on display board and do the cutout of the person. Remember these need to be structurally sound, which is why you see some white around the feet of these people cutouts. And, no fair sending us a photo of a hockey player making a slapshot- that’s the kind of thing that just wants to be broken off. This entry was posted in Flatbed printing and tagged cardboard people, cutouts of people, people cutouts, person cutouts. Bookmark the permalink.